"Wrangler," a Laoban colt out of Promising Vow, August 2018. A stallion's first crop of foals goes a long way in establishing his reputation for the years that follow, and first impressions can have a big hand in setting that path. 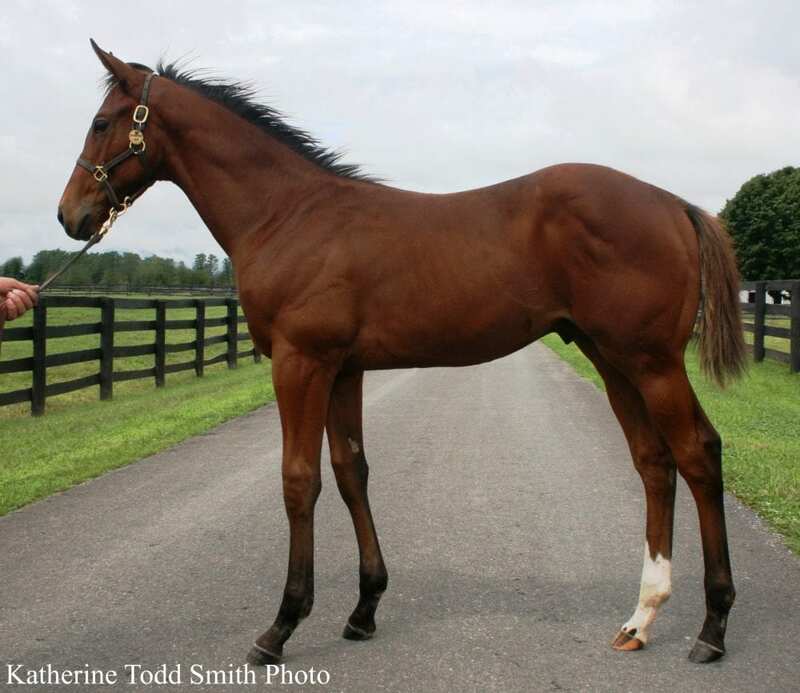 This monthly series will document the background, development and routine of the four-month-old Wrangler, a colt from the first crop of Laoban, as he is brought along from a foal beside his mother at Sequel New York to a weanling offered at the upcoming Fasig-Tipton Saratoga Fall Mixed Sale in October, as told by Sequel's Becky Thomas, Molly Lightner, and Teri Brown. 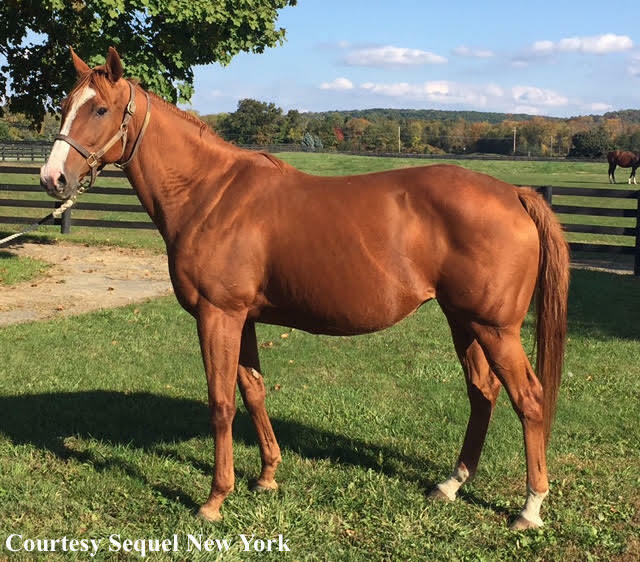 Wrangler was born April 27 at Sequel New York in Hudson, N.Y., out of the Broken Vow mare Promising Vow. The mare is owned by Becky Thomas and Lyn Burleson, who operate under the name Wrangler Stables, inspiring the colt's own name. Thomas: Right now, he's not quite four months old. He's got a good personality. He's an easy-going guy, but he's not a baby. We'll see how he does after weaning next week. He might turn into a tiger. Brown: He's very much his sire. I've seen a lot of Laobans and they are very Uncle Mo-looking – they're tall and brown. They're very typical of Uncle Mo – tall, leggy, stretchy. He's got very good definition to the body. Our barn builder that helps us from Kentucky, Charles Parker, was looking at him and he said, “I want to work out where he works out.” He's very cut-looking. Thomas: Our plan right now is to use him as a showcase horse at the Fasig-Tipton Saratoga Fall Mixed Sale. I don't know what other people are going to have in terms of Laobans, but in New York, we want to try to make sure we have a representative that looks like the sire. I could have picked any of four of them that were cookie-cutter like him, but I wanted for our consignment to at least have one that looked like that. I think it's important that breeders see what they look like. He hasn't gotten himself into too much trouble. He's just been middle of the road – not a pansy, but not a tiger shark either. He's been very willing to learn his lessons, and hopefully the weaning process will go well and we'll move on to the next steps. Laoban was part of Uncle Mo's record-setting first crop, winning the Grade 2 Jim Dandy Stakes at Saratoga and posting lifetime earnings of $526,250. 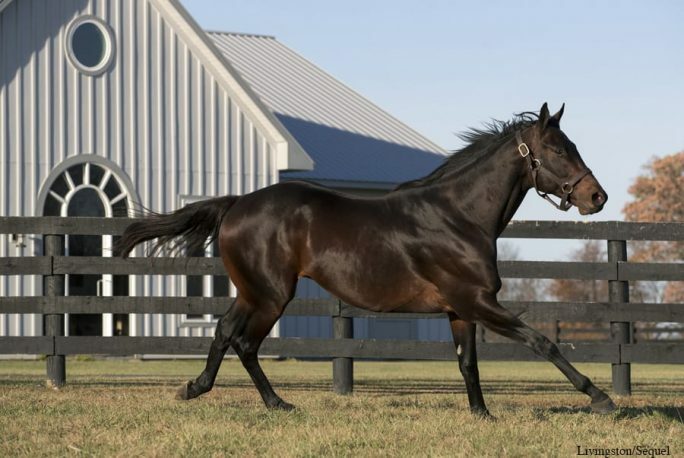 He retired to Sequel New York for the 2017 breeding season, and he stood for an advertised fee of $7,500 in 2018. Lightner: Laoban has been very well received by breeders. In fact he was the most popular sire in New York in his first season, breeding more mares (122) than any other sire in New York. When the Jockey Club releases the 2018 numbers in October, we'll see where he stacks up but we believe he will be on or near the top of the list again with 91 mares, including a bunch of folks that bred back. Thomas: He's quite easygoing. He's ready to go and very willing, but so far, I would not take note of him being on one end of the spectrum or the other [from a temperament standpoint]. He's very even-tempered. He's had two breeding years, and you can still very much treat him like a horse in training. He has a bouncy ball, and you can play with him with the ball, and he'll take it and run all over the place with it. A lot of them get out of that behavior the older they get, but he loves it. Thomas: She is an athletic-looking Broken Vow. I'm a Broken Vow fan, but this one doesn't have as much of the Nijinsky influence. She's not a big, tall Broken Vow. She's a medium-sized mare that's got good overall balance. She's had kind of a bumpy produce record. I bought her from Chester Broman and she had a couple issues, so he no longer wanted to keep breeding her. She hasn't produced anything that's exemplary yet, but I've got a Freud filly in my yearling division that's her best yet, and then the baby coming behind her is coming along well. We chose Laoban for this mating because he's a big, tall, leggy, stretchy horse. He's got a really good hip and shoulder, and this mare, even though she's not a typical two-turn pedigree, she's got a European-type pedigree. I wanted to throw a little more hip on her than she had and a little more size. Promising Vow is back in foal to Union Jackson on a May 23 cover. Thomas: He's learning to eat on his own and we're starting the process of separation. Those horses that are going early [to the sale] get handled even before they're weaned. They're taught to walk beside their mom, they're taught with a person leading them. They're taught to lead, and they're taught to eat. We don't get in a hurry weaning our babies. He's been on-schedule since we picked him in August, so he has the ability to eat on his own, as well as eating with his mom. I think he's an early-maturing foal that's quite attractive. For us, I want the public to see a horse that's representative of what the stallion looks like and what he's throwing. We wanted to get a few out there. In this case, Joe McMahon [of McMahon of Saratoga Thoroughbreds] is offering one he likes, and there are two that I know of that are going to be in the Keeneland November sale that are going to be representatives of Laoban. Lightner: We are lucky to have horse identifier Katherine Todd Smith come up from Florida to the farm every year to do the registration applications for us. She and farm manager Teri Brown go through all the foals on the farm. They pull hairs to send off with the DNA kits to the lab. They insert and scan the microchips. They take pictures and note the markings to be sent to The Jockey Club. Katherine was at the farm last week. She stayed with our farm managers Teri and Buster Brown for a couple days while they registered 56 foals. We are happy to report that Wrangler was a very good boy for the registration process. Next month: Wrangler gets weaned and works toward the sale. This entry was posted in Bloodstock, Follow A Foal, NL List and tagged Becky Thomas, fasig-tipton saratoga fall mixed sale, Follow a Foal, Katherine Todd Smith, laoban, Molly Lightner, Promising Vow, sequel new york, teri brown, Uncle Mo, Wrangler, Wrangler Stables by Joe Nevills. Bookmark the permalink.